Although all turtles have certain dietary aspects in common, box turtles don't necessarily chow down on the same foods as red-eared slider turtles and tortoises. Each turtle type, to some degree, has specific dietary requirements, and you'll notice even more variations as you learn about what your particular pet enjoys most. American box turtles are happy roaming the woods and enjoying a varied omnivorous diet. Box turtles held in captivity will eat the same snacks as their wild cousins, including fruits, vegetables, grasses, greens, snails, slugs and bugs. In fact, box turtles will give nearly everything a taste if they happen upon it, so it's essential that you control quantities and accessibility to ensure your pet's health. 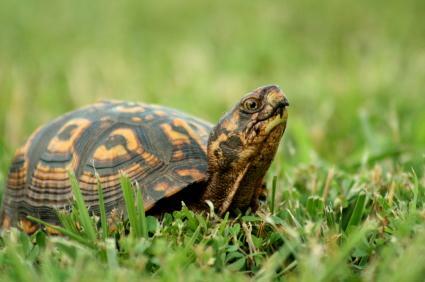 Box turtle meal can be purchased in pet stores that carry supplies for reptiles and fish. All box turtles need some kind of calcium addition in their diet, and they will get that if you provide a cuttlebone or a calcium supplement. One example of a quality turtle calcium supplement is Repti-Cal, which comes highly recommended by reptile enthusiasts. Besides commercially-produced turtle food, you should try to mix up a salad and offer a variety of live snacks. Examples of possible additions follow. One thing to note about box turtles is their inability to eat large or difficult-to-pierce foods. Be sure to section, dice and slice all foods for easy snacking. While box turtles enjoy grazing on small snacks of a varied nature, many box turtles, especially babie box turtles who are adjusting to their enclosure, have difficulty eating some foods. Just like other small pets, turtles that don't want to eat may be enticed to do so when offered soaked food. Buy a small mister and fill it with lukewarm water to soften food. In an extreme case, you can mash your turtle's commercial diet with some shaved carrots or another of his favorite treats. Here are a few other helpful tips to ensure your pet eats properly. Always vary your box turtle's diet as much as possible so he doesn't become bored with his food. If you primarily stick to commercial turtle meal, rotate between quality brands. Don't overfeed live foods like mealworms or crickets. When a turtle enjoys eating these foods and gets them often, he will certainly get bored with plain meal and vegetables. Use caution when offering your box turtle fruits. Most turtles love fruit, but vegetables should be the staple of his fresh diet. It's easiest to purchase your box turtle's food from your local pet supply store, but here are a few places to check out if you prefer to shop online. Pet Guys.com offers box turle food and related supplies. EntirelyPets.com offers a good variety of turtle food. While shopping for box turtle food, remember that buying the cheapest food simply means that you'll need to add more supplements to your pet's diet. Always choose high-quality food that offers the best nutritional components, and then concentrate on healthy treats. Just like with humans, it's all about balance.